Halloween approaches in just a few days, but there is still time to get ready . . . by reading the enlightening meditation by Alvin Boyd Kuhn entitled Hallowe'en: A Festival of Lost Meanings. The entire booklet is only 33 pages long (in its electronic format's electronic pagination -- 64 pages long in the original pagination, of which the "pages" are very short, only a paragraph or two each, with two or three of them appearing on every "page" of the electronic layout), and it is available for your enjoyment on the web here (click on the word "fullscreen" under the image of the book to read it in a book-like format online, selecting either single-page view or two-page view side-by-side). Don't be fooled by its compact form, however: in this little volume Alvin Boyd Kuhn packs a virtual library's worth of elucidation of the ancient wisdom, as he explores the rich symbology and esoteric instruction available for our edification in the vital twin-holidays of Halloween and All-Saints' Day. Kuhn begins by explaining that All-Hallow's Eve or the Hallowed Evening, together with All-Hallow's or All-Soul's or All-Saints' Day, is intimately connected with the message of the autumnal equinox, and that it thus stands as one of the four most important festival-days of the annual cycle, alongside the celebrations at the winter solstice, spring equinox, and summer solstice (pages 4 through 8 in Kuhn's original pagination, which are visible on the pages of the online edition linked above -- all subsequent page references will be to the original pagination). Kuhn sadly predicts that in some future world "of more enlightened intelligence," men and women may look back upon our own age as "the epoch in which the people celebrated a series of religious festivals around the cycle of the year in nearly total ignorance of their true significance" (2). He also imagines that the ancients who have gone on long before us "must register uncomprehending dismay at the sight of our ghastly misconception and utterly travestied motives in our commemoration of the great annual festivals their dramatic genius instituted round the year" -- a melancholy thought (2). The night revelry of Halloween on October 31, and the daylight commemoration of All Soul's or All Saints' Day, Kuhn argues, were originally intended to powerfully convey the soul's plunge into matter in the incarnation (symbolized by Halloween), and the subsequent glorification of the soul's return to spirit, "the dawn of a new life cycle" (10). Kuhn then proceeds to pile on exhibit after exhibit of evidence to support this understanding of the mysterious autumn festival. The first remarkable insight he brings out is the fact that Halloween is in fact celebrated forty days after the actual date of the fall equinox, which takes place in the northern hemisphere on September 21 or 22 (there is some slippage on the date each year, due to the fact that the earth does not rotate on its axis an exactly even number of days before returning to the same point on its annual orbit around the sun). Forty days after September 21 would be October 31, the day of Halloween, and forty days after September 22 would be November 01, All-Hallow's Day. The number 40, Kuhn argues (backing his assertions up with more evidence from ancient scriptures and other sources) represents the time of the germination of a seed, and the time of gestation in the womb (he points out, for example, that the human period of gestation or pregnancy is forty weeks -- a fact which you can easily verify for yourself with a quick search on the internet, which indicates that doctors generally count forty weeks or 280 days, and not "nine months"). The "Holy Night" or "Hallowed Even" was therefore set for the fortieth day following the autumn equinox, with the signification that the soul entered incarnation (Latin carno means "flesh") on September 21, ran its cycle of evolution over its forty days of "incubation" or embodiment in the soil of human life and on October 31 culminated its progress at the end in its final glorification in the hallowed state of incipient godhood. It entered the cycle as the soul of a mortal human being and emerged at the end in the blessed ranks of the gods. 10 - 11. In another of the absolute jewels of insight with which the book is strewn, Kuhn later describes this same concept by saying: "In body the soul sits or gropes in material darkness until the turn of the cycle brings the dawn of the spiritual day, when it is awakened out of its dreamy condition in the shadows of unreality into the bright day of its full vision of truth" (14). Here Kuhn is articulating a declaration which closely echoes the words of the Lakota holy man Black Elk, who said that this life is but a shadow of "the real world that is behind this one," the spirit world. This truth, that this material realm and our incarnate sojourn through it are actually but shadows of the real world of spirit, is embodied in the festival of Halloween, a celebration which revels in the night, in the shadows, and in all that is weird and surreal. "Hallowe'en is par excellence the ritualization of the Incarnation," Kuhn says. He then proceeds to go through the rich symbols of the celebration (showing that it has ancient origins, and connections to festivals such as Saturnalia and others), and to demonstrate the ways which they all illuminate aspects of the teaching that our incarnation in these material forms is a temporary plunging of a divine spiritual spark into matter. For instance, he notes that the traditional dress of "the Fool" is parti-coloured, that is to say half one color and half another (sometimes including the painting of the face half one color and half another), which visually expresses the mystery that in each one of us there are two natures combined together, both of which are integral to our human experience. It shows, Kuhn says, that our nature "is dually compounded and dually divided, soul and body, god and animal" (39). The wearing of masks is another expression of the same truth, Kuhn explains, for it viscerally demonstrates the clothing of the inner divine spark with the animal or carnal physical body. "The god in us can only speak out through the lips of our animal selves," Kuhn says (31). The symbology of the moon itself can be seen to illustrate this concept, for in the reflection upon the moon the sun's original light is only dimly reflected, just as in our incarnate selves the sun-rays of spirit are softened and dimmed by their marriage to matter (52). On and on the symbols flow, powerfully reinforcing the understanding of Halloween as the celebration of our incarnation. Perhaps the most widely-recognized symbol of Halloween is the jack o'lantern, or pumpkin carved with grinning human features and illuminated with an inner candle. Again, the symbolism could not be more illustrative of our incarnate condition, Kuhn argues. We are an earthly organism with a divine spark inside (57). He notes that this same symbology, of a hidden flame inside of a temporary earthly vessel, is also found in the Old Testament passage of Gideon and the Midianites, in which Gideon instructs each member of his army to hide a lamp inside of a clay pot (Judges 7). But Kuhn's intention is not merely to list all these symbols, but rather to get at the real question, the deeper question, the real tension that lies at the heart of the celebration of Halloween even to this day, which is this: "does all this animalistic or grotesque imagery mean that the incarnation is bad?" What is the reason that we have a celebration of the carnal and the dark? Why, when we get right down to it, would a divine spark incarnate in a physical body at all? Kuhn does not shy away from this question, but rather meets it head-on, while declaring that the suppression of the physical side of our nature is as dangerous as the suppression of the spiritual side. He argues that, like the prodigal son in the New Testament parable who came to his realization through reflection on his actions (actions which eventually involved sinking to the level of the swine), it is through contemplation of and reflection upon the lessons of our actions here in the material body that we achieve the spiritual lessons which lead to our transformation. The Greek myth of Phaeton, son of Apollo, rashly essaying to drive the sun-chariot of his father across the sky and letting it get out of hand, so that the Sun-God had to strike him down to save the world, is a variant graph of the same conception. It is no derogation of the theological presupposition underlying this delineation of evolutionary process that the youthful god in man's nature had to indulge in a veritable revel of license in his use of the powers of the body which is the kingdom he is given to rule. Otherwise we must ask how he would ever learn their power and master the art of bringing the under his control for their true function in the upward movement which carries both him and the forward to grander being. As he took the reins of directive rulership in his hands and whipped up the fiery steeds of the physical chariot he must learn to drive, he became familiar with their capabilities and their power, saw how they could be exploited for high service and at any rate took keen note of the outcome of his efforts. It was in this way that his rioting with them brought a return to invaluable benefit to himself. For it is out of reflection upon the consequences of our acts that mind is born. And only when mind assumes full direction of the soul's employment of the life forces will the still higher birth of spirit be brought to pass. Even the fool's folly becomes in the end, through the pain that follows it, life's appointed schoolmaster, our pedagogue in growth. Out of our wildest orgies eventually emerge the principles of wisdom. Our reason returns to us. 32-33. And thus our being "cast down" into the physical body becomes the vehicle for our gaining of wisdom and our later transcendence and spiritual growth, according to the ancient teaching. As we have already seen, this "casting down" was illustrated in the yearly wheel at the point of the fall equinox -- a point that was associated with the zodiac sign of Virgo. And here we see one more brilliant metaphor in the mysterious and little-understood festival of Halloween: the image of the witch. Kuhn explains that the circling of witches around the cauldron perfectly illustrate the cycles of incarnation, and the boiling cauldron itself perfectly illustrates the seething passions and conflicts of this earthly existence (44). The action of the witches dancing around the fire and the cauldron typify the forces which cast us down into this incarnate material existence, personified in the goddess of magic and darkness Hecate herself, whose name Kuhn demonstrates (on pages 47 - 52) to be related to the word hex, which means both "a spell" and (in German) "a witch," but which also relates to the number six, which is the number of the cube and which (unfolded) creates the cross of material existence upon which we are "hexed" or "crossed" in this incarnate existence (for extended discussion of the cross-symbol as representative of our dual state in this incarnate life, see this blog post and follow some of the links within it to previous discussions on the topic, as desired). Thus the goddess-power who is depicted as sending us into this incarnate life takes the form of Hecate at Halloween, as well as the form of the witches circling and circling around the cauldron. But remember that, as discussed above, the ancient teaching implied that we come down into the incarnation for our benefit, for our transformation, and for our gaining of wisdom, enlightenment, and consciousness. Thus, the very name witch, as Kuhn demonstrates, has at its root the word which gives us "wit" and "wisdom" and "wise" (and "wizard"), and is related to the German word wissen, "to know" (43). And Halloween, the festival of darkness that was traditionally followed by All-Hallow's Day, remains as a signpost trying to point us to that wisdom: to teach us about this mystery of the incarnation, its purpose and its promise. It remains like an old, weather-beaten mile-marker along an ancient trail: erected in ages long past to convey information, which today we can barely make out. In its use of potent symbols, it continues to carry its ancient message, if we can only remember the key to translating that message. In this way, it is very much like the message in the stars, and in the Star Myths which continue to carry a message that has somehow been obscured and nearly forgotten, but which can still be deciphered once we recover the key to the cipher. And in fact, the symbols of these annual festivals and the symbols of the stars themselves are very closely aligned -- as we would expect: for does not the celebration of earthly revelries upon important days that are determined by heavenly markers not indicate that the festivals themselves are a form of "bringing down" to earth the markers of the celestial sphere? (What follows is my own added "Star Myth" interpretation to the subjects we have been discussing). 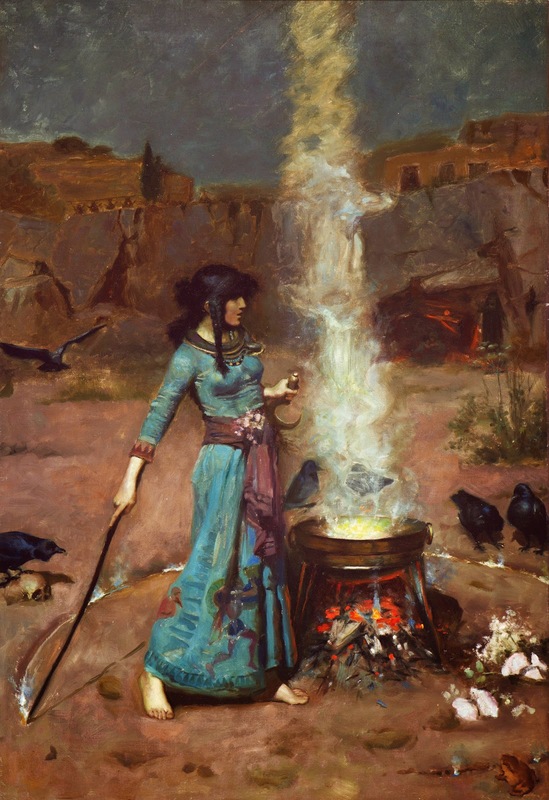 To see what I mean when I say that these ancient festivals with their symbols are a sort of "earthly" form of the celestial markers in the heavens above, look again at the painting above, of the witch drawing her magic circle around a fiery cauldron as the crows gather to watch and participate (by John William Waterhouse, from 1886). Note the symbology which the artist employs: she has a long stick in one hand, and a golden sickle in the other (an instrument fraught with many layers of meaning, but one of them is simply the harvesting of grain or wheat). Nearby there is a cauldron, and watching her intently are the crows. 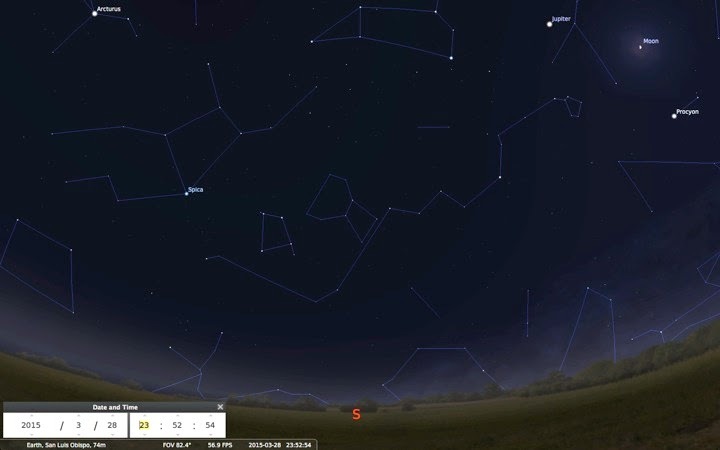 Now look below at the region of the night sky in which we find the constellation Virgo, the zodiac sign who presides over the autumnal equinox and the "casting down" of souls into incarnation (the point at which the sun's ecliptic drops back down below the celestial equator, and the days once again become shorter than the nights). The above screen-shot does not have the outlines as suggested by H. A. Rey, and therefore Virgo is somewhat "incompletely drawn," but I include the "un-labeled" version above so that you can see where the stars are, before I draw in the lines. Virgo is the constellation in the center-left as we look at the image, with the star Spica on her hip, which is labeled. Spica was anciently associated with a sheaf of wheat, as you can see from this older image of the constellation Virgo. This is why the witch in the painting is holding a sickle in one hand. Looking at the outline of Virgo above, can you see why she is holding a long stick (or magic wand) in her other hand? There is Virgo, casting souls down to incarnation: transforming them into "animal" form with her wand (clothing them in physical matter). 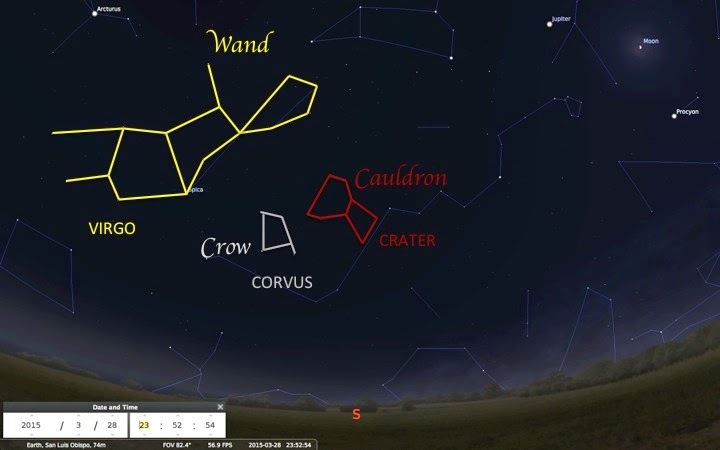 Next to her is the brilliant little constellation of Corvus the Crow (here is a previous discussion of this delightful constellation -- easy to spot, during the months in which Virgo is high in the sky during the prime viewing hours of the night, but not right now). Next to Corvus, and composed of much fainter stars, is a constellation known as Crater the Cup, which no doubt functions as the witches' cauldron. And so the ancient festivals, derived as they were from the motions of the heavens and the heavenly bodies, and the ancient myths, derived from the stars and the constellations, all worked together to convey to us a profound view of nature and of the nature of human existence. As Alvin Boyd Kuhn noted at the beginning of his booklet on Halloween and All-Saints' Day, these ancient signposts have now fallen into such a state of disrepair that few today give them much thought. And yet they are still there, patiently sending forth their message to us, night after night, and year after year. What a thrill we get when we suddenly begin to understand what they are saying! And what strange and wonderful things they have to say to us!